Fake Bake followed the trend of coming out with a “Water Mousse”. Basically it’s a tanning mousse with no color guide, so it literally has the appearance of water. I ended up giving Fake Bake Tanning Water 2 out of 5 stars, so it’s not my favorite. Honestly, my favorite part of this self tanner is the luxurious mitt it comes with. It makes it so easy to apply! The application is very easy and clean, as you don’t need to worry about a brown guide staining anything. But you do need to be careful, as you can’t see where the product is being applied. In my opinion, this product stinks. It has a very strong floral perfume scent that I really don’t care for. The drying time and price point are average. The color it gives is a nice, light tan, but it just wasn’t nearly as dark as I’d hoped. It’s more of a gradual tanner that you’ll need to apply every day or two to maintain color. I also used SO much product for only one application. So I think the entire bottle will only last 2 or 3 full body applications. There are some Fake Bake products that I really love, but unfortunately, this just isn’t one of them. This mousse follows the trend of the “tanning waters” which are mousses that look like water. So it pumps out white, and looks kind of like shaving cream. There’s no color guide to see where you apply to your skin. This Fake Bake mousse has a nice fluffy texture; I really liked it. This product comes with a mitt; the mitt was probably my favorite part of this product! The mitt is really high quality; it feels soft and velvety on both sides and did a great job protecting my palms from the product. Now, the mitt helps greatly with application, but you still need to be careful. Since this mousse has no color guide in it, you’ll need to pay attention to where you’re applying it. It can be easy to miss spots if you don’t watch where you’re applying! I found the application of this mousse to be very clean and easy. I like that I didn’t need to worry about a dark guide staining all my stuff. This mousse is pretty average as far as drying time goes. It took about 30-40 minutes to dry, and while it dries, it feels pretty sticky. One plus is you don’t need to worry about it staining anything while you wait for it to dry. Fake Bake Tanning Water has a very strong scent. It smells very perfume-y and floral-y in my opinion. I wish they would’ve kept the scent the same as their original spray, because that one smells so good! The scent is pretty overwhelming and gave me a headache. I could also smell some DHA as well. Needless to say, I’m not a fan of the scent. As my tan developed, the DHA smell became stronger and stronger, almost to the point where it was unbearable. The floral, perfume scent lasted for a few hours before it somewhat dissipated. Fake Bake Tanning Water produces a very natural, light color. If you’re looking for a dark tan, look elsewhere. The shade this one gives is a gradual, light shade. Now it did look very natural, and if you’re looking for a light tan, I think you’ll like the color. But for me, the color just wasn’t dark enough. My tan was even and streak free, but my ankles looked a little orange compared to the rest of my body. So overall, I like the color for a lighter tan, but I had expected it to be darker as this is not a gradual self tanner. My tan lasted only 2 days, which unfortunately, isn’t very good. After about 2 days, my tan was pretty much gone. The good news is it didn’t get patchy as it faded. Honestly, this isn’t my favorite self tanner. It doesn’t smell good and the color is too light for me personally. So I don’t think men will like it. This Fake Bake mousse sells for $30.00, which works out to about $4.50 per ounce. This is an average price. 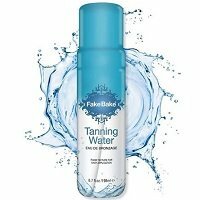 To buy Fake Bake Tanning Water, Click Here. Look and Feel It’s a fluffy, white mousse. Application It comes with a mitt and is easy to apply. Drying Time It dried in 30-40 minutes. Smell (Before) Smells very strongly of floral perfume. Smell (After) Smells like DHA the next morning. Color Produced This one gives a light, even tan. OK For Men? No, I wouldn’t recommend for men. Price It’s $4.50 per ounce, that’s average.